I absolutely love the Minnesota North Shore of Lake Superior. For the last six years we have driven up there approximately twice a year, and we have yet to run out of new places to explore or grow bored of the places that we have already been. My absolutely favorite place to camp so far has been Split Rock Lighthouse State Park. I’ve reviewed cart-in site 19 on The Dyrt previously, this time I’m reviewing cart-in site 9. The best part of camping here is that every campsite is unique, and most of them offer more privacy than you would get at a drive-in campground. You definitely get less road noise the closer you are to the lake. There is a parking lot designated for cart-in campers. The carts themselves are kind of hidden behind a row of trees, just walk towards the bathroom structure in order to find them. Grab the cart with your campsite number on it and keep it at your site until you are ready to pack out. Keep in mind that MOST of the campsites require pushing the cart up or down a hill, so maybe take multiple trips or have extra people help carry some of the mid-weight items. The obvious draw to this park is the lighthouse- it is run by the Minnesota Historical Society and you have to pay to even get up close to it. We have yet to cough up the fee to enter this area, but there are numerous places on the edge of the cliffs that offer great views of the lighthouse (the most Instagrammable spots are definitely outside of this special fee zone). The trail system is relatively extensive thanks to some regional trails cutting through the park. The Superior Hiking trail and paved Gitchi-Gami trails are some options, and one of the hiking trails is open to mountain bikers as well. We actually tend to just hang out at our campsite when we camp here, but we did go on the Day Hill trail and went up to the observation point. It was unexpectedly beautiful and also featured a random fireplace that is apparently a great spot for a fire. As a Dyrt Ranger I was offered the opportunity to review the RōM Pack from RōM Outdoors. It is a 3-in-1 engineered feat that offers you the ability to use it as a hiking pack, a poncho, or a blanket. I have to admit that I was skeptical when I first received it. This thing is made out of heavy duty materials and weighs in at 4.6 pounds, is wider than me, and when it was empty it really didn’t form to my body at all. I was really pleased that I wound up loving it! What I really loved about it is that the wide straps really distribute the weight well on your body. I was nervous about how heavy it was already when it was empty, and for our major day hike I had probably between 15-20 pounds extra in it. This probably doesn’t seem like that big of a deal, but in addition to having a generally achy back I’ve had a LOT of stress-induced tightness in my neck and upper back. Despite this, I wound up carrying the pack for most of our moderately-difficult ~5 hour hike on the Superior Hiking Trail to Bean and Bear lake. I never felt any soreness from this pack at all, and in fact the only reason I asked my husband to carry it for the last stretch was because my glutes were giving out (fitness tracker said we climbed 121 flights of stairs!!). I was thrilled that when I took off the pack that all of my recent stiffness was reduced by about 90%!!! The weight of the pack combined with all of my movement must have stretched my muscles out in a therapeutic way. Some of the stiffness has creeped back, and I’m tempted to cancel all of my appointments that I scheduled last week for it and just go for another hike with this pack instead! I got to try out the poncho feature at Tettegouche state park on my last North Shore day- it was ~45 degrees and was constantly raining. I was able to figure out how to convert the pack into a poncho quite easily, but I will definitely need a tutorial to convert it back into a pack. The thickness of the material was perfect for keeping me warm in this temperature- it might be too heavy for a hot weather rain. I felt a little self-conscious because of the backpack straps hanging off the front. You can either keep your hands inside of the poncho or use the snap buttons to close up the edges into sleeves. Snap button strength- I only wore the rompack as a poncho for a 1.5 mile hike. I used the snaps to create “sleeves” and most of the snaps came undone with basic movements. Waist straps- I only used the chest load balance strap since I found that the waist strap wasn’t terribly comfortable. I definitely would have preferred a waist strap that features padding like the Journey pack. Chest strap tightness- I had this load balance strap as tight as it would go- and there is definitely an opportunity to make the non-adjustable side of the straps adjustable. Poncho hood coverage- My head is big- women’s hats generally don’t fit me. I thought that the hood could be slightly larger or feature a bill that pops out to prevent rain from getting on my face/glasses. Shoulder strap placement- When you are wearing this product as a poncho the straps kind of just hang down the front. I’m not a backpack/poncho engineer, but it seemed like you could easily rotate the hood opening 180 degrees and have the straps go down your back instead. It also seems like there is an opportunity to put snaps on the shoulder pads to keep them flat against the poncho. Bottle holders- the pack features two mesh pockets for water bottles or other things that you want to keep handy. They aren’t stretchy, which means that wider water bottles might not be able to be stored here. Colors- Hopefully as RōM Outdoors grows they could expand their color selection. Kate and Jeremy run the Hungry Hippie Hostel. It has been two years since we last stayed with them, and since then they have expanded their lodging options to three Frost River canvas tents and 5 primitive campsites. These additions were accompanied by the construction of what might be my favorite toilet/shower outbuilding that I have ever come across. Oh yeah, they also bought Hughie’s Tacos in Grand Marais. I’m excited about all of this because everything is enjoyable AND affordable- this is a hard combo to come across in the North Shore of Minnesota’s private sector. Private rooms and bunk beds in the upstairs communal room in the hostel itself are rented out through Airbnb. The nice thing about the rooms are that they are clean, climate controlled, and cozy. However, you WILL hear your neighbors even with your door shut. If you are a light sleeper like me you can forget sleeping in because someone inevitably will start grinding coffee in the common room. This is always fine by me because THERE IS SO MUCH TO DO ON THE NORTH SHORE and time slept beyond what is necessary for a day of adventure is time wasted. This is why I’m excited about the Frost River campfire tents (Duluth Pack is the ubiquitous canvas goods producer in Minnesota- but not for long!!). They go for $59+tax a night and you have an amazing panoramic view from your little haven. The tents are located a quick walk away from the communal fire ring and the new bathroom building. Bring your own linens for a queen air mattress. 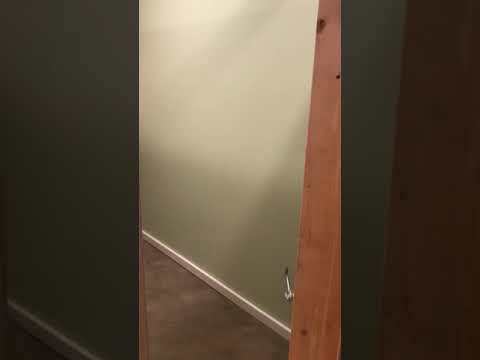 I’ve attached a video of the bathroom which has three toilet stalls and two shower stalls. Disclaimer: I did not actually camp here. There are two group campsites that are available, but considering that my friends aren’t big campers I wasn’t willing to pay $85 a night for a campsite (and I’m pretty sure these get booked up quickly on the weekends). I’ll talk more about the two group sites later. I really liked this park, it felt like there was something available for everyone. When I first pulled in I checked out the single track trail area first and the parking lot was full of mountain bikers. This newly developed trail is 13.25 miles long, so a nice option close to the city for those who are inclined to adventurous biking. Different loops are available for varying skill levels. There are two water access points- one for Lake Rebecca and one for the nearby Crow River. There are also boat rentals available, I’ll attach a pic of this season’s current rates. There are also two fishing docks located not too far from the main beach area. I didn’t get in the water so I have no idea how clean it is, but there were many happy swimmers. Keep in mind that there are no lifeguards on duty. In addition to the single track unpaved trail there is also a horse trail and a paved trail that looks in good condition- I’m hoping to bring my horse to check out the former and my roller blades to check out the latter. This park has always been relatively nearby to where I have lived, but I have never actually been before my visit this weekend since other horse riders have always had cautionary tales about how bad the bugs are here. I am not sure how they are on the horse trails, but I set up my hammock in a wooded area and I didn’t think that the amount of mosquitos that approached me was anything note-worthy. I haven’t been to the group campsites yet to scope them out, someday soon hopefully, but these are the descriptions that I was able to track down online. My one gripe about the Three Rivers park district is that finding information about the campgrounds isn't as straight forward as it should be. Sarah Creek group campsite can accommodate 80 people and it has a barn and hitching posts. The amount of horses that it can support is unknown. There is a volleyball net, grill, fire ring, water pump and latrines (so I’m guessing rustic). The South group campsite seems to be geared more towards mountain bikers since it has a garage-esque structure that I’m guessing you would store your bikes in. It can accommodate 50 people, has a grill, water pump latrines, fire ring, and horseshoe pit. Weeknights are $70 and weekends/holidays are $85. This seems like a huge steal considering how many people these sites can accommodate!!! As a Dyrt ranger, I received a gift card to REI for participating in a recent campground review contest. I recently became obsessed with hammocks, and thanks to a BOGO from Trek Light I now have two. One of the hammocks I received was part of a bundle and came with ropes already, but the other didn’t. Before I bought a second pair of the same ropes I decided I wanted to see how well they worked before I spent another $20 on just basic ropes that aren’t terribly long. I purchased a set of ENO Atlas hammock straps for $29.95 and they are well worth the $10 price difference. The ENO straps are 9 feet long each and together can hold up to 400 pounds. Instead of fiddling with tying knots and retying them to get the perfect adjustment, I can just move the hook on my hammock between the pre-stitched rings as necessary. The extra length and the quick adjustments are greatly appreciated by someone who is still new to hammocks and isn’t great at eyeballing things. ENO does have a set of longer straps that are each 13.5 feet long, but I figure that if I find myself in a situation where the trees are too far apart for these straps I can just attach my ropes to the Eno straps and take advantage of the double capacity feature of my hammock. So Far I’m really impressed with how easy these are to loop around the trees and adjust the tension of my hammock. I love Split Rock lighthouse state park. Of all of the North Shore campgrounds, I think that this one has the best campsites. Sure if you have a lake view you are on a cliff and can't readily access the lake from your site, but the views are amazing. I believe that we had cart-in site 18 and it was a site worth remembering. The trail to the campsites was a little more strenuous than a few other cart-in campground that I've been to, but it wasn't a deterrent at all to visiting again. In addition to the great view the other amazing aspect of this site was how private it felt. We couldn't see or hear our neighbors at all. A few of the cart-in sites are definitely on display though. Overall experience was worth dealing with pit toilets being the only nearby option. We spent two nights here in late October and froze at night. I would recommend a cold temp sleeping bag for sure if you are here in the fall. Also make sure to note that your state park pass does not get you access to the light house, there is an additional fee to go past a secured boundary. Make sure to make your reservations ASAP because this campground fills up FAST. We opted to spend the night here on our way back to the Twin Cities from Colorado. We stayed at C4- it was nice and private enough from our nearby neighbors. Going to the Wind Cave was really neat- be warned the elevator is currently out of service so you would have to go through the natural entrance. While we were there it was dry enough so that there was a fire ban. Wind Cave is about an hour away from Reptile Gardens (which definitely exceeded my expectations). Last August we headed to Blue Mounds to investigate out the SW corner of our state for the first time. We swung through New Ulm on the way there to check out the Schell's brewing company and we also stopped at Laura Ingalls Wilder's Plum Creek to break up the drive from the twin cities. The drive itself got pretty boring on the last half- lots of flat fields and cows. As you get closer to Luverne things start to become more interesting and the town of Luverne itself was an unexpected delight. Yes, the water currently has e.coli in it. There is a huge alert on the park's page explaining how you can go about accessing water and showers nearby. The $17 rate is the discounted price to reflect the e. coli discount. The main campground is pretty open, some sites have shade, it is a prairie after all. The cart-in campsite offers much more privacy with the grove of trees there. The bathroom facility at the drive-in campground is much nicer than the one for the tipis and cart-in sites. We spent one night in the tipi (cool experience for $30-$35 a night) and two nights at a cart-in site w-09. Some of the paths to the cart-in sites are not flat and rather long, but ours wasn't bad at all. I would definitely consider staying at that campsite again. I don't think I would necessarily stay in a tipi again unless I could book it on short notice if I knew that the weather was going to be dry and cool. The day before we got there it had rained quit a bit and when we arrived it was HOT. This meant that we got to enjoy our tipi experience with the aroma of hot wet tipi. The tipi floor is a platform made out of manufactured deck boards that keep you off the ground. The tipi itself isn't nearly as critter-proof as a tent. We wound up packing up our belongings and putting them in our car between leaving the tipi and moving into our campsite since we wanted to go check out the local area before we could check into our next site and somehow a garter snake got transported out of the tipi in our belongings and into our car- awesome haha. The park was flooded a few years back which washed out a quite a bit- the lake that used to be there is now gone and just overgrown with plants. Most of the park is dedicated to the bison, so hiking opportunities are kind of limited. There are a ton of bison, but you either get to see them or you don't unless you go on one of their bison tours. They were present by the fence twice while we were there. There is pretty much a large trail loop with another large loop that swings off of that. Bring a wide-brimmed hat and tons of sun screen, not much tree cover on the trails. The one visitor center located in the southern portion of the park appeared to be permanently closed. Luverne was cool. There are tons of historic houses and next time I'm out there I'll spend some time driving through neighborhoods to check them out. There is a basic grocery store off of Main Street for anything that you may need to pick up. I kind of wish that we had gone out to eat in town more because of how great the food was. Sterling's was delicious and much more upscale than anything I expected to find out there, the local Buffalo Sweat beer was great enough that I tried to find it at the local liquor store before I left. Showers are available at the Luverne aquatic center for free. This park isn't too far away from my stable and I frequent it every once in a while with my horse. I'm not sure why I decided to camp here for one night, but I did, and I'll probably never do it again. I've come to realize that county park campers and state park campers are entirely different creatures when it comes to self-awareness and goals of camping. This is obviously a complete generalization, but the former doesn't seem to be a serious camper and is looking to experience low-commitment camping as an alternative to partying in their garage and the latter is someone like me who finds camping to be restorative experience. The majority of the campsites here offer little to no privacy, which is fine if you are into either socializing with strangers nearby or at the least hearing all of their interactions. I have never quit a campground before, but we ended up leaving at 10 pm once it was clear that this was going to remain a loud campground. The park itself isn't one that I would go more than an hour out of my way to visit, but I do enjoy it when I am there. I really like Itasca state park- I just wish that it were closer to me! The paved trail from the visitor center to the headwaters is in incredible shape- I regret not bringing roller blades. One of the most important things to know for avid hikers is that it seems like most park visitors are there to relax and maybe do the one paved trail, which leaves a lot of the trails overgrown. We were able to take the trail to the fire tower which was nice. There was an attempt to take a trail that seemed like it would have a nice view of one of the smaller lakes that you pass as you drive in, but it was extremely over grown and there were no real clear views of the lake from the trail. The lake is amazing for swimming- there are also rentals for canoes, kayaks, and bikes. I absolutely loved the on-site restaurant- wild rice pancakes were phenomenal and the view is great. We stayed at a cart-in site at Bearpaw campground and our friends rented one of the nearby Bearpaw cabins. The site was nice and private enough, but a huge storm came through at night (so much lightning that my husband and I could see each other for around a solid minute) came through on the second night and we had to retreat to our car to avoid being smooshed by a tree. The cabin was nice and cozy- it had a tiny kitchen that was sufficient enough for a few meals but definitely plan on bringing your own kitchen tools in case they don't have what you need. This park is only about 50 minutes away from me, and for hiking/camping I only think it is worth a trip in the fall. I went a few weeks ago for the first time in the summer and I thought it was just kind of average as far as hiking goes. Campsites and cabins are walk-in only as far as I know and the site I visited had a private rustic pit toilet a stones throw away. The campsites ARE nice though and private, this just felt too close to home and too similar to parks that are closer. Last year the middle of October was prime color season- drive to the very end where Little Mary Lake is (the bigger lake) and behold- your new destination for your annual family portrait session. Seriously, the yellow leaves are VIVID. This is my all-time favorite park to bring my horse to, and it's her favorite trail too. Seriously, when we head back to our trailer she will stop and refuse to proceed. Do a 180 on the trail and she is happy to trot away from the trailer. Horse camping is available in two locations in the park, even though once when I was there a family was camping in the parking with their horses. Apparently they got the cops called on them by some other park patrons who didn't believe that this was an option. At the time it was marked as a camping location on the map, but that may have changed. The best place to be bug-free happens to be the sandy prairie trails, the wooded areas are nice but you may want to hustle out of there if you don't have enough bug protection. For non-horse riders some parts of the trail out in the open prairie might be a bit sandy. Also important to note- bikes are NOT allowed on the trails. Absolutely gorgeous in the fall. Pit toilets are available and there is water available at the entrance off of Park drive, not sure about the other locations. Due to severely late trip-planning, this was the only North Shore state park with a site available that didn't require backpacking in. We stayed at cart-in campsite #31 which you can practically see from the cart-in parking lot. A cart for each cart-in site is provided, and there is a pit toilet and a water spigot located at that parking lot. The site is located above lake superior and slightly inland, so a decent view if you are sitting in the right spot but it has nothing on the lake-side sites at Split Rock Lighthouse state park. The reason for the average rating is that this campground is kind of long and skinny, which means that you will hear all the cars going by at 60 MPH unless you have a large buffer between your site and Hwy 61. The trail system isn't nearly as vast as neighboring state parks- you can pretty much do a quick stroll through the lake-side portion of the park or go up the trail that follows the river (so lovely). You can take offshoot trails that are part of the Superior Hiking trail- but these are kind of overgrown and I'm tick-phobic. I wouldn't consider this a must-camp destination, but it was perfectly suitable as a quick place to spend a night on our way up to the Gunflint trail. I would say this is a great campsite for campers who aren't leaving their site much or for people who don't need a lot of trail options. The main bathroom facility isn't nearly as nice as the new one at Cascade River, but it is well-maintained considering its age. I would recommend showering early to avoid lines- I think there were just two or three shower stalls? I had this past weekend planned as a 4-day weekend for quite some time without any actual firm plans until last Monday. This would have been a disaster had I planned on staying at a state park, but this national forest campsite had A LOT of openings and we even snagged one of the cabins for a night. This campground does not appear as though many of their sites are heavily used. The campsites that weren't close to the lake were vacant to the point that the "open" grassy areas were long and growing to seed. I would have been disappointed if I had wound up booking one of those since a weed whipper isn't something that I would ever consider having to pack. The toilets are pit only- not the worst or the best that I have ever seen, and there are no shower facilities. There is a drinking water tap located by campsite 3, but the two of us were feeling slightly ill a few hours after brushing our teeth and swishing with it. Before you hit the campground you will drive past the Bearskin Lodge. This lodge manages the campground- but don't feel like you need to stop here to check in if you know the specifics about your reservation- your name is already on the campsite post. The staff there are friendly and they have a few food items in addition to camping basics such as firewood and ice available to purchase. Their lattes were surprisingly good for being in the middle of nowhere and the homemade ice cream sandwich was perfect on a hot day. Canoes and kayaks are also available to rent. There isn't a restaurant onsite- I would recommend going to the Loon Lake lodge for their all-you-care-to-eat breakfast from 8-9:30 if you are heading up the Gunflint Trail in the morning. This price is an unbelievable bargain for the quality of food. Ok back to the campground! The first night we stayed at campsite #5. It has a nice little path to a private little area on the lake. This site was relatively private and had plenty of room to park 1-2 vehicles. The site was flat and required no extra effort to haul your stuff from your vehicle to where you wanted to set up your campsite. Several sites- #6 and whatever is directly across from #5 require climbing up a hill from your car to the actual site. This would be quite a pain if it had been raining. The firepit was nice enough with a grill that you could flip on or off. For our final night we stayed at the Tamarack cabin. If I remember correctly up to 7 people could sleep here with 2 bunk beds and two pads also provided in the loft. There is also an awesome screen porch with basic plastic chairs on the front that I wish that I had more time to sit in. You don't get a key, but the door is lockable from the inside. I think that it would be kind of cramped if it were filled to capacity on a rainy day. I would also probably be a sleepless mess if I had to share this cabin with more than just my husband on account of how creaky the bunk bed and the floors could be. The lake is pretty nice for swimming- the lake access point is pretty clear of weeds and you are able to walk out a bit before it gets too deep for an adult. The parking lot was pretty full for a Friday at mid-day without seeing anyone around, so it was nice to have the lake "to ourselves" for a quick swim/float. Overall I was very pleased with the experience that we were able to obtain considering that we put off making reservations and had never heard of this campground before.